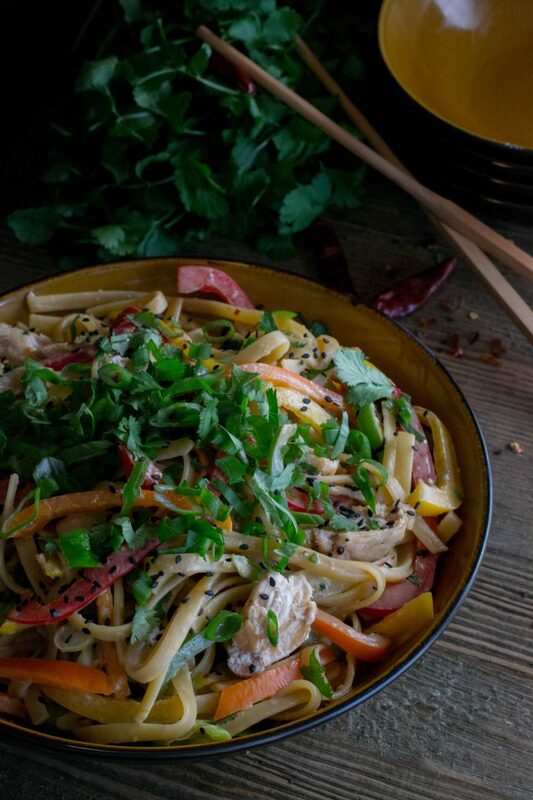 noodles Archives - What the Forks for Dinner? 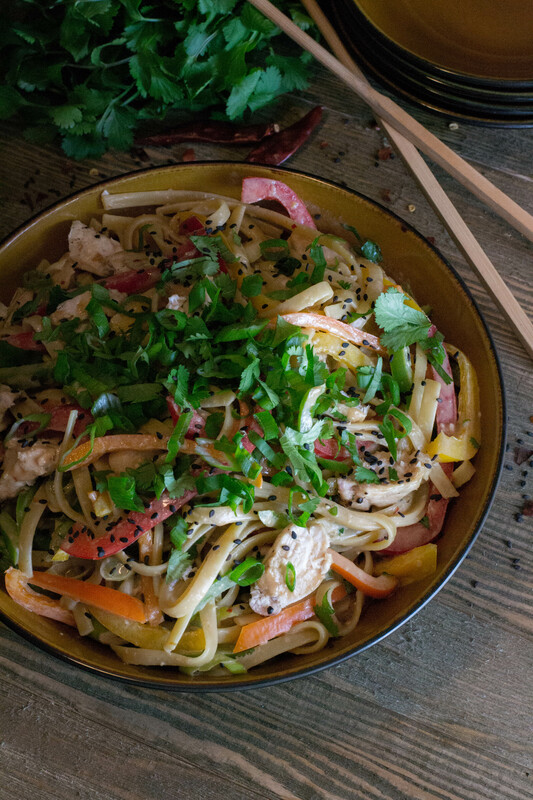 Better than “take out” cause you made it yourself, Asian Chicken Peanut Noodles is loaded with chicken, crunchy peppers, green onions, and covered in a no-cook creamy, slightly spicy peanut sauce. Weekdays are stressful enough without having to fuss over What the “Forks” for Dinner? Having a great go-to recipe at hand is a godsend! It’s rainy day……..Thank goodness I got all my shopping done before the rain came. I love to grocery shop! I know a lot of people do not, but it is like an adventure to me. I also am frequently inspired while there. For a small town, our local grocery stores have a nice variety, and a nice supply of Organic items, that I have been inspired to buy. 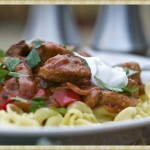 Tim and I love pork tenderloin, so I was thinking about something with noodles……hearty, with a bit of a kick. So, thanks to the folks at Cooking Light I found just the right recipe. 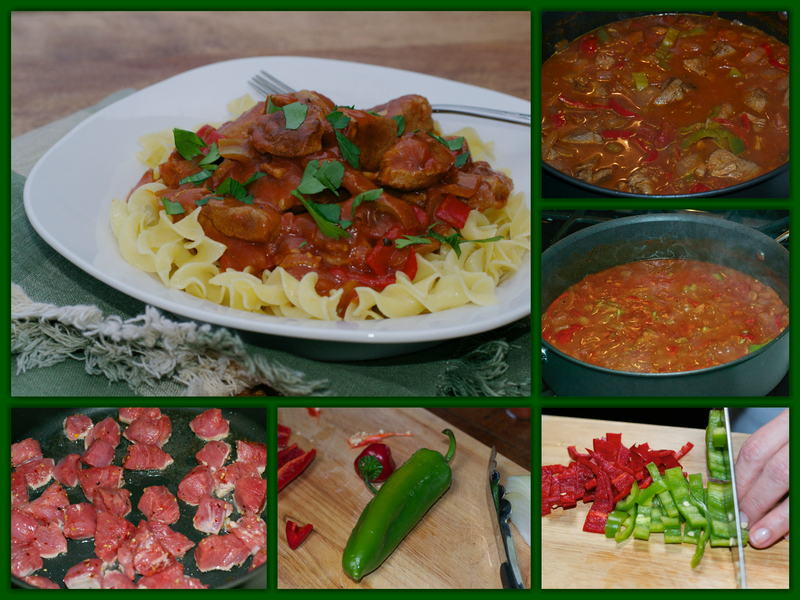 I did change it just a bit, but I’ve got to give credit, as I would never have thought to use pork tenderloin for a Hungarian Goulash. 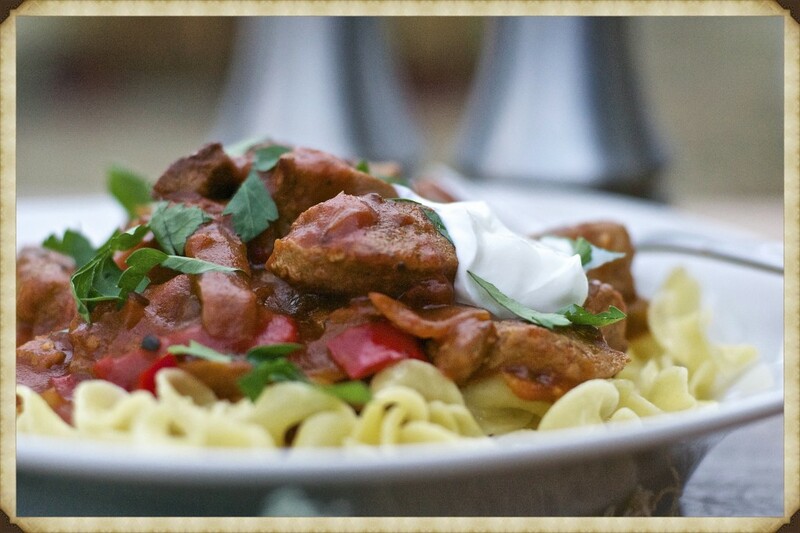 I remember Goulash as a child was, browned hamburger, tomato sauce, and noodles. One secret ingredient that my Mom always added was brown sugar, it made it slightly sweet. My brother and I loved it like that,and to this day, if I make the hamburger kind I always add the brown sugar. I did not add it to this recipe, but………..maybe next time. So it was a an easy dish to make, without a long simmer time, since pork tenderloin is a very tender cut of meat. The recipe has chiles that add the heat that Tim likes so well, and smoked paprika that gives it an oaky, smokey flavor…………… all in a nice tomato base. This is one of those dishes that gets better the next day…………so I’m glad there was some left! Place garlic in a small bowl; mash with the back of a spoon to form a paste. Add 1/4 teaspoon salt, caraway seeds, and 1/8 teaspoon black pepper. Heat a large Dutch oven over high heat. Coat pan with cooking spray. Combine 1/4 teaspoon salt, remaining 1/8 teaspoon black pepper, and pork in a medium bowl; toss. Add pork to pan; sauté 6 minutes, browning on all sides. Remove pork from pan. Reduce heat to medium-high; return pan to heat. Add onion and bacon; sauté 7 minutes or until bacon is done, stirring frequently. Stir in garlic mixture; cook for 1 minute, stirring constantly. Add 1 1/2 cups water, tomato, paprika, and beer; bring to a boil. Reduce heat, and simmer 30 minutes, stirring occasionally. Stir in red pepper and chiles; simmer 15 minutes. Add pork to pan; simmer 15 minutes, stirring occasionally. Combine remaining 1/4 cup water and flour in a small bowl; stir with a whisk. Stir flour mixture and remaining 1/2 teaspoon salt into pork mixture. Bring to a boil; cook 1 minute, stirring constantly.